The words of my friend (and expert traveler) Chris echoed in my head this afternoon as I sat on the plane, waiting to take off. 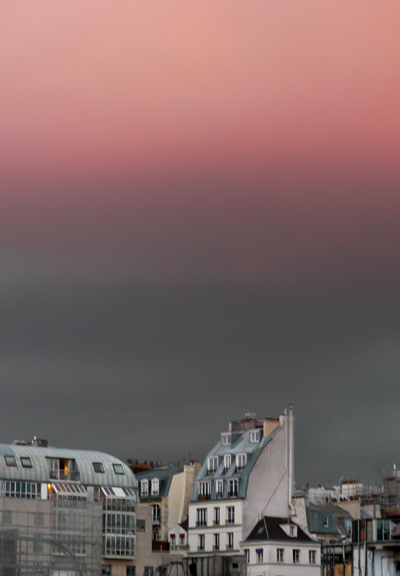 I’ve daydreamed about the adventures that await me in Paris. Will this trip develop a theme, as my previous sojourns have? Will I make new friends—or will I be content to just reconnect with old ones? I thought about the places I’d want to visit again this morning, and the ones I’d probably skip. I fantasized about biting into my first crèpe Nutella and sipping my tenth verre du vin. 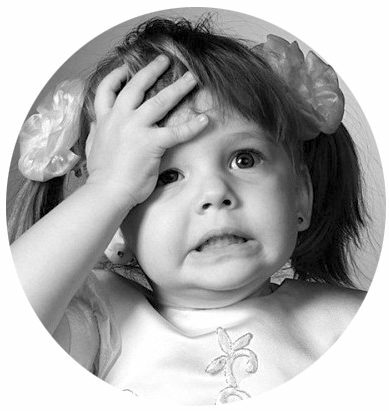 I wondered how many steps I’d manage to take before I (finally … inevitably) stepped in dog poop. All of those questions will be answered in time. For now, all that matters is this: I’m. In. Paris! 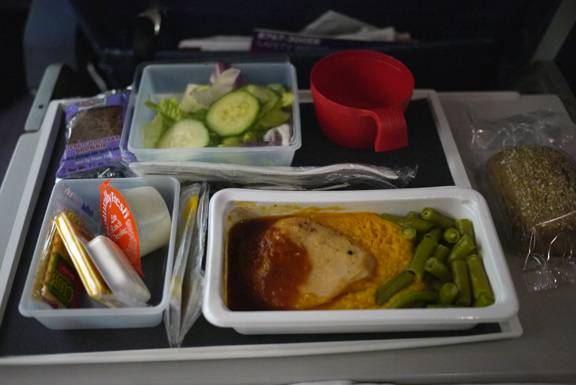 The trip started inauspiciously, with a culinary fiasco the flight attendants called “chicken.” Its gelatinous texture suggested aspic, and it was so generously seasoned that it rendered salt licks obsolete. But I forgot all about that when we met Chris and his wife Silke for our first glass of the 2011 Beaujolais Nouveau. We shared a bottle at the appropriately named JetLag bar in the 2nd arrondissement. Then, the four of us headed out for dinner in earnest. 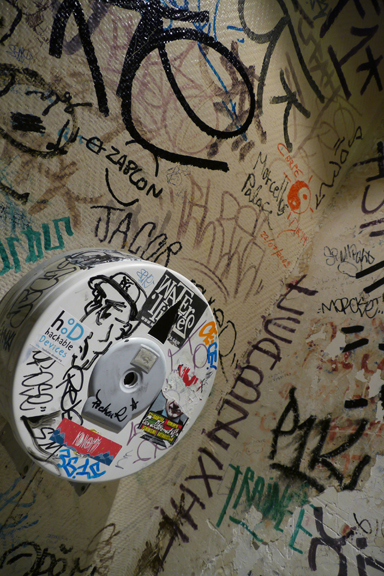 And I couldn’t resist snapping a photo in the world’s most graffiti-covered bathroom. I’m not. I came here with no expectations. Maybe I’ll shoot some more tomorrow. Maybe I won’t. Either way, I’ll have a great time. Thanks for tagging along — and please stay tuned. There’s much, much more to come. where are the photos we can see without expectations? minnesota blueberry jam and french croissants for breakfast. oooh lala! Ha, ha! Our bandwidth at the apartment is deplorable, so I’m limiting myself to the bare minimum of photos. Glad you’re enjoying your jam, though. Too bad they were out of the lingonberry kind; that’s my favorite. Not disappointed at all: in fact that first picture is stunning and I’m pretty sure I’ve never seen anything like it. I am ready indeed, Keith. Hang on — we’re about to cover *a lot* of ground together! If there are any old haunts you’d like me to visit for you, please drop me a note. I would adore being your remote-control photographer. Grin. Thank you so much — though sorry about the jealousy part. 🙂 Working on my next post, so stay tuned. 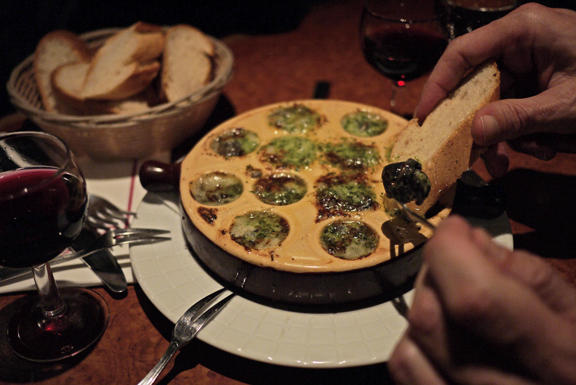 Why eat that gelatinous substance when you had escargots waiting? I could almost taste them — yum!! !